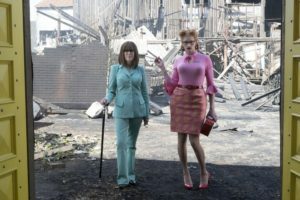 The last two episodes of the first season of A Series of Unfortunate Events don’t only cover the story of The Miserable Mill, but also add some context to the teasing scenes we’ve been shown of the VFD parents as well as set up the second season. The original plot of The Miserable Mill is also expanded, so that we learn more about the mysterious and overly business-minded “Sir” (though not his name) and the nefarious Doctor Georgina Orwell and her past with Count Olaf. The three Baudelaires found themselves recruited as child labor at the Lucky Smells Lumber Mill, which did not turn out to be lucky for them at all. They were forced to perform heavy manual labor while being paid in worthless coupons and fed only chewing gum by the extremely stingy Sir. Once again, they meet a few well-meaning but essentially unhelpful adults in Phil, their optimistic co-worker, and Charles, Sir’s partner. But there are more secrets about their parents’ past that they seek to find answers to and they continue their investigation. But as they continue their efforts, Klaus gets hypnotized and manipulated by Dr. Orwell, Count Olaf’s ex-girlfriend, and the Count disguises himself as Shirley St. Ives, a receptionist eager to adopt some children. The Baudelaires discover a conspiracy where Dr. Orwell hypnotizes all the workers at the Lumber Mill so that they will agree to work for no proper wages. Violet learns the code word that will snap them out of the hypnosis and sets the workers free, causing an angry mob that leads to a fatal accident at the Lumber Mill. But the big reveal in these couple of episodes is the true identity of the daring couple who have been trying to escape their difficult predicaments since episode one. Since they constantly expressed their concern for their children, it was easy to assume that they could be the Baudelaire parents, miraculously surviving the terrible fire that left the children orphans. But this is A Series of Unfortunate Events after all, and there were never going to be any happy endings, no matter how tempting. And really, although I knew I was being set up for a painful revelation, it still hurt immensely to find out that the resourceful young couple were actually the Quagmire parents. And the story became doubly tragic when the next scene with that family showed their house being burned down, just like what happened to the Baudelaires. As always, moments of joy are rare and fleeting and always followed by A Series of Unfortunate Events. At the end of the episode, Mr. Poe is driving the three Baudelaires to a gloomy boarding school, the Prufrock Preparatory, the setting of the next book, The Austere Academy. There is also a glimpse at the two triplets who will become their close friends, Duncan and Isadora Quagmire. A Series of Unfortunate Events season one ends with a melancholy musical number performed by Lemony Snicket, Count Olaf, Mr. Poe, and the three Baudelaires as they lament their fates and assure us that there are no happy endings for this story. As gloomy and depressing as the tales are, they have been consistently fascinating and very well-executed and, misery or no misery, I am so excited about how Netflix will continue to adapt the rest of the novels.